My old friend Alex started talking about golf a lot on Facebook a few years ago. There are a few people I follow that talk about golf but for the most part discussion on the sport is about professional players but very few focus on the mass majority that just like to play. So they are launching with a rolling raffle (of a souped up customer loyalty program) which is a very interesting way to kickstart the company. The main prize is a golf trip of your dreams. Cost to be a member / per ticket is $99 and comes with a dozen ProV1 balls and a few other gifts. So as far as a review I’d say I’m thrilled that he is doing this. He has been around the game for years and is just honestly talking about why he loves it from what is on TV to getting out and getting a round in this week. The weekly instagram live chats are really informative. I bought a ticket for $99 (and that came with $50 of balls) and won a tee time for 4 already… so of course I love it. Support a fun project, stay for the community, and make sure to get out there and play. 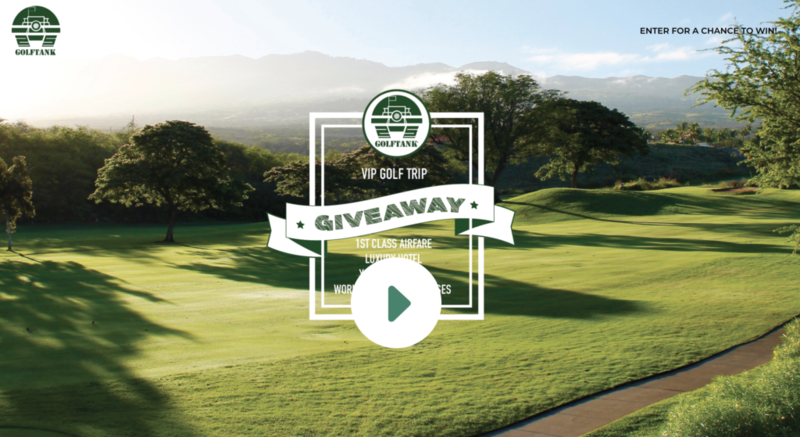 Enter for your chance to win at GolfTank. This post isn’t sponsored, I just like Alex and what he is doing. I’d love to see it as a huge success! If you want to golf, send me an email or contact me on twitter.